An idea that has been often repeated in baroque dance circles over many years is that professional dancing on the stage was the same as the amateur dancing seen in ballrooms. Certainly the two genres share the same basic vocabulary of steps and figures and some of the surviving notated theatrical dances appear (on the page) to be simpler and easier than some of the more complex ballroom choreographies. There was undoubtedly some overlap in technique, if not in style, but I do not subscribe to the view that there was little difference between the two. Weaver, as both a professional dancer and a teacher of amateurs, was familiar with the differences of scale and force between the two techniques. He concedes that ‘the Steps of both are generally the same’ but he adds ‘yet they differ in performance’ and goes on to list a number of steps ‘peculiarly adapted’ to stage dancing, specifying ‘almost all Steps from the Ground’ as meant for theatrical practitioners. Most of the dances in these collections have named performers – leading dancers either at the Paris Opéra or in the London theatres – and many of them make significant technical demands. Of particular interest are the male solos and duets, which demand a virtuoso level of technique. All of these choreographies carry within them the seeds of what will later become classical ballet. Yet, they are not merely the precursors of a later superior form of dance. They represent an already fully developed, refined and sophisticated art of dancing. I will explore this repertoire, as well as other aspects of stage dancing in London and in Paris, in future posts. 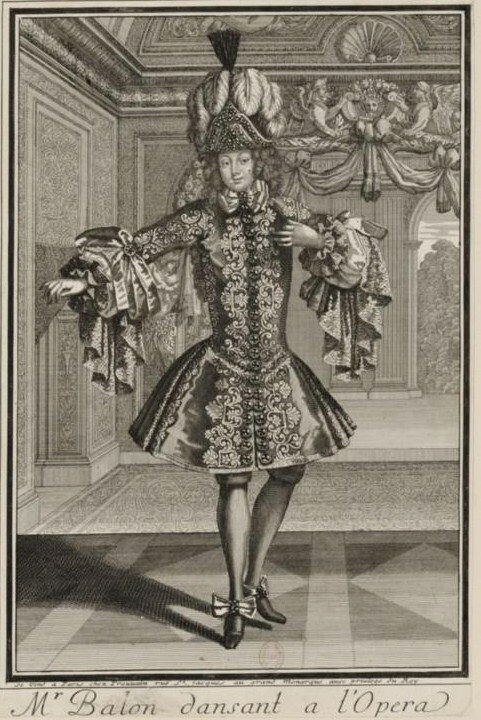 Claude Ballon, one of the most famous danseurs nobles of the early 18th century. This entry was posted in Dance Treatises & Notations, Stage Dancing, Steps & Figures and tagged Anthony L’Abbé, Baroque Dance, Guillaume-Louis Pecour on March 11, 2015 by moiragoff.